In 2017, all tasks in the WHEALBI project have seen important achievements. All 512 barley and 512 wheat varieties of the WHEALBI panels have been multiplied and most made available through INRA and IPK gene banks. EXOME data have been re-analyzed with the recently updated reference sequences of barley and wheat. Two major manuscripts describing the levels of polymorphism, its spatial and temporal structuration, the evolutionary forces that shape the diversity and its interest in breeding programs are ready to be submitted in high standard scientific journals. Evaluation data in the field and in controlled conditions for disease, frost and drought tolerance, canopy development and adaptive phenology have also been analyzed together with polymorphisms in candidate genes to identify useful associations. Other deliverables have been produced, like newly developed pre-breeding materials such as barley and wheat lines with introgression of alien (other species) or exotic (e.g. old landraces) genetic materials into modern lines, which are easier to use in applied breeding programs. These newly developed materials have been characterized for both agronomic traits and molecular markers. Statistical methods have been adapted or developed to address specific issues of genomic prediction of breeding value in such materials. Management trials have been conducted in UK, Hungary and Italy with a subset of diverse barley and wheat lines to identify ideotypes most adapted to conservation agriculture or organic farming. Many trainings and dissemination events, like the college project (http://www.whealbi.eu/college-project-videos/) have been organized in 2017 and many videos have been produced (http://www.whealbi.eu/presentation-of-the-whealbi-project/). Finally, the two last trainings, one on agronomy and one on pre-breeding, are organized in 2018 at NIAB in UK, and registration are just open (http://www.whealbi.eu/trainings-crop-management-innovative-cropping-systems-practical-assisted-pre-breeding-may-2018-cambridge/). I wish you, on behalf of the WHEALBI consortium, all the best for 2018! 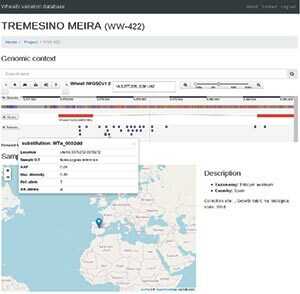 The variation data access portal developed previously in the frame of WP4 was adjusted to accommodate the variation data generated from the improved wheat reference sequence. This new portal version was made available thanks to the work of HMGU and can be accessed through https://pgsb.helmholtz-muenchen.de/whealbi. The portal enables researchers to interactively browse the variation data in their genomic and gene-annotation context. Detailed information about the quality of the variants (e.g. detected genotype of a sample) can be easily accessed. Specific gene models or variants can be searched by name and additional search options can/will be added if required or available. Access to the data base can be granted by requesting a username/password to the contact page. During the 7-9 June 2017, a training about Databases, SNP calling and genetic analysis of multi-environment data was organized by Wageningen University, Helmholtz Zentrum München and INRA, in the framework of WP4. The organizers were pleased because of the high interest in this workshop, reaching more than 35 participants. Participants were diverse, consisting of plant breeders, students and researchers from various fields related to plant breeding. The workshop was subdivided in three parts. The first part involved a demo of the Whealbi database, teaching participants how to use the query options (taught by INRA). The second part consisted of a hands-on training of variant calling using a sub-sampling of the data generated in Whealbi (taught by Helmholtz Zentrum München and INRA). The main learning goal was to teach an actionable work-flow of variant detection from reference and raw sequence data to variation data. The third part of the workshop (8th and 9th June) covered the topics of spatial analysis of field trials, GxE analysis, QTL detection and GWAS (taught by Biometris, Wageningen University). The workshop ended with a discussion about advanced topics and genomic prediction. Participants had the opportunity to apply the concepts discussed in the lectures via computer exercises, giving them practical tools that can be used for their own research. 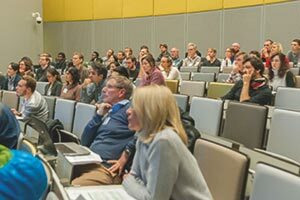 A symposium on genotype to phenotype modelling in relation to adaptation and GxE took place in Wageningen the 16th of November 2017. The symposium was co-organized by WUR-Biometris and Whealbi, with a program subdivided in three sessions. The first session focused on the importance of collecting, generating and characterizing the genetic variation for traits contributing to adaptation. During this session, Gilles Charmet (coordinator of the EU-Whealbi project) gave an overview about the project objectives and achievements. He also discussed the potential of genetic resources like the ones in the Whealbi wheat and barley collections as source of valuable alleles to obtain well-adapted varieties. The second session focused on strategies for phenotypic characterization across environments. A number of modelling approaches to integrate phenotypic data from the field and high throughput phenotyping platforms with genetic/genomic data were discussed. Finally, we discussed statistical and crop growth modelling approaches to connect genotypes and phenotypes across environments. Speakers at the symposium ‘Genotype to Phenotype Modelling of Plant Adaptation’. 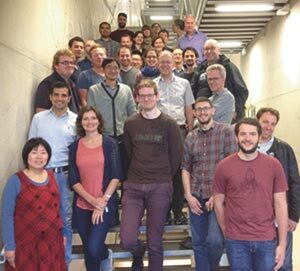 From left to right: Chris Schön (TUM), Scott Chapman (CSIRO), Charlie Messina (DuPont-Pioneer), Francois Tardieu (LEPSE), Ep Heuvelink (WUR), Cris Wijnen (WUR), Fred van Eeuwijk (WUR), Daniela Bustos-Korts (WUR), Willem Kruijer (WUR), Gilles Charmet (INRA). More than 80 people joined this symposium allowing a fruitful discussion. The 2018 annual meeting will be organized by JHI in Scotland 23-25th of October 2018. This final annual meeting will discuss internal issues to the project and is not open to the broad community. Both trainings have a limited number of attendees (35 each) and can be attended independently. Inscription will favour young researchers (Ph.Ds and post-doc) and private companies. Please register through the WHEALBI website and wait for confirmation (end of March) to book your travel. For more infos: contact@whealbi.eu . To communicate around WHEALBI project and show the importance of genetic resources for the future of agriculture, 5 European agriculture colleges and universities, coming from 5 different countries (Italy, France, UK, Germany and Hungary) were involved in the dissemination of the project. Each of the participating university was asked to conduct for one year the same trial containing 16 wheat and 16 barley (showing high diversity: different origins, landraces or modern varieties…), the set of varieties coming from the pool of varieties studied in the WHEALBI project. The students investigated for one year the genetic diversity contained in this pool of varieties, with the opportunity to exchange observations and questions with the other European students observing the same varieties, but in a different environment. 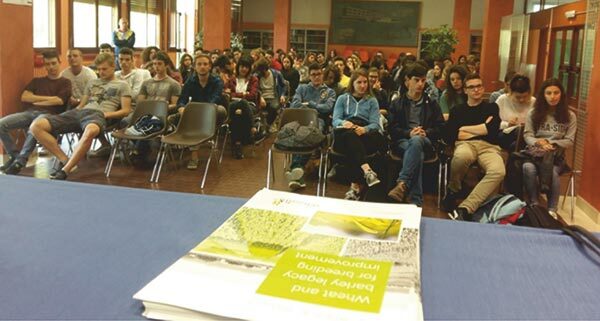 This project gave us the opportunity to explain to the students the functioning of Europe and the Europe of Research, how a European research project works with the detailed example of WHEALBI, and gave them the chance to work on a concrete case with crop genetic diversity and discuss the importance of genetic resources for breeding. Students have been involved in 2016-2017 and lot of data, material, interaction have been produced. A number of videos have been released in 2017 and published on different social networks with a short description explaining the WHEALBI project. INRA, the WHEALBI coordinating institute, is organizing the next meeting (symposium) of EUCARPIA, cereal section (https://symposium.inra.fr/eucarpia-cereal2018/). The cereal section congress of EUCARPIA (www.eucarpia.org) is the opportunity to learn about recent developments in genetics and cereal breeding, from basic research on quantitative genetics, breeding methodology, crop modelling, genome organization and evolution to applied research on genome editing, QTL detection for marker assisted selection, plant-micro-organism interaction, biotic and abiotic stresses. The meeting takes place in Clermont-Ferrand, 19-21 march, 2018. Registrations are still open until beginning of February 2018. This meeting will give WHEALBI consortium the opportunity to present some highlights on WHEALBI results.